Content Warnings: What and Why Are They? If you've read reviews on our site before, you'll note that we include a bunch of information with each review. This includes tropes (enemies-to-lovers), tags (Regency), and a "heat" rating. In the body of each review, we do our best to include content warnings as well. We are not alone in this, but it's also far from a universal practice. Since there's been a lot of discussion about content warnings in the romance community lately, here's the Love in Panels approach. What content warnings are, what they are not, how they benefit readers (and authors), and how we use them. I've also included notes on other approaches used by reviewers/readers where appropriate. Content warnings are tags for content in a book that may affect readers in a negative way. They are not tags like "fated mates," but rather for things like "miscarriage." Most of the time, content warnings are inclusive of trigger warnings, which have been around for a long time and are used to help readers avoid things that may trigger PSTD or other similar results of trauma. We use content warnings as a larger umbrella, however. There are some things in books that aren't necessarily "triggering" but that a reader may not be in a place to read about or may want to be forewarned. To use a personal example, I had difficulty conceiving and then morning sickness for a solid six months with my second child. I read a lot of romance during that period because it was an escape from the reality of my body. I did not want to read a pregnant heroine. I did not want to read a heroine who had a miscarriage. I did not want to read a heroine who was struggling to conceive. All of these things have a place in romance. They can be immensely helpful for readers who are on a healing journey, who have a different experience with pregnancy, etc. 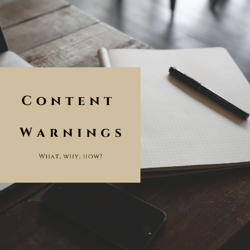 A content warning simply helps identify content for a reader. It is not a judgment about the existence of said content. In many cases, things like pregnancy, miscarriage, cancer, or death of a child are used as dramatic events in a story - catalysts for big emotional plots. This is all well and good, but a reader may not want to be surprised by them. In more triggering cases, a reader who is surprised by, for example, a cancer subplot, may be thrown into an emotional abyss. This is because of the emotional stakes of a romance. If we agree that the point of a romance novel is to make a reader feel something, then a skilled romance novelist will put the reader into a space of grief or despair or hope or relief right along with the characters. Someone who has lost a loved one to cancer may find it particularly healing to read a story like their own - or they may find it particularly hurtful. I've received tons of content warnings about books and gone on to read the book. Having the warning helps the reader to not be blindsided by something that will either personally harm them or make them want to pitch the book across the room and never read that author again. If you're an author, don't you want us to keep reading your books? Surprising us with on-page sexual assault is maybe not the best way to do that. Content warnings give readers choices. They fill in gaps in a blurb and allow a reader to make an informed choice. Content warnings can certainly "spoil" parts of a book for readers. But they don't have to. I went back and forth for days when I was reviewing Sarah Maclean's Day of the Duchess. (The book has now been out for 2 years, don't come at me for spoiling things now.) Before the book begins, the reader is unaware of what happened to the pregnant eldest sister, Sera. Within the first few pages, however, we read that the heroine had a late-term, traumatic miscarriage and was banished by her husband's family. This has huge emotional impact on all of the characters in the book and is a major plot point as we move through the story. But if I'm writing a review before the book comes out... do I talk about it? The answer is yes... and no. I wasn't writing for my own site at the time, so I danced around the topic. Were I writing for Love in Panels, I would have been vague in the review and then included relevant content warnings. In my experience, this is the best of both worlds - readers who want to be totally unspoiled can skip the content warnings, and readers who want to know that the book will throw them into a three day emotional hangover will have access to that information. Moreover, content warnings do not refer to a specific character in the book. They are simply tags like "homophobia," and a reader can inquire with the author or reviewer if they need more details. That homophobia could be coming from the main characters or experienced by the main characters. Sometimes you may see things like "internalized misogyny," and it's more clear that the tag applies to a female or AFAB character. Content warnings are generated by humans, so there are limitations. The same goes for reviewers, especially if the reviewer is of a different background/experience than the author or characters. Reviewers will miss things. The most we can do is our best. 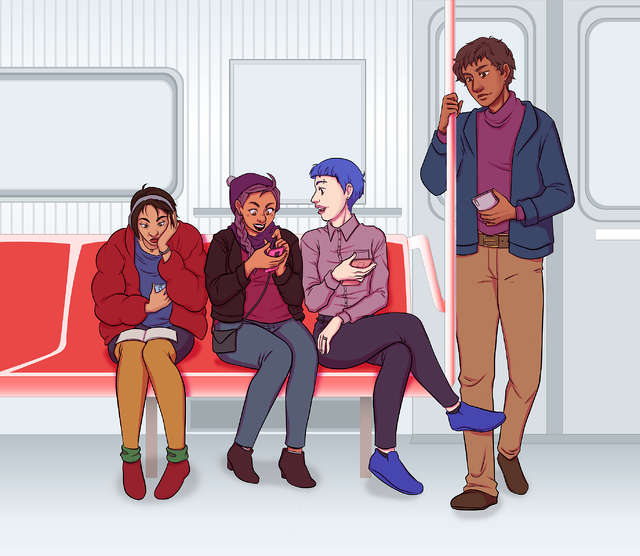 Every reader brings their own experiences to a book, which means that what one person reads and flags for a content warning may be different from another person. I've seen that among my own review team, and we're fairly like-minded readers. One discussion led by Corey Alexander recently had me thinking a lot about how and where we place content warnings. They were asking readers if the readers would prefer CWs at the beginning of a review or at the end, and a few said they'd prefer them to be at the beginning because sometimes the review itself can be triggering. A fellow reviewer (not for LiP) says that she mentions sensitive content in the body of her review, which is also an option but doesn't necessarily address the issue Corey brought up. As a reviewer or writer, you'll need to find what works best for you and, more importantly, for your readers. Do not discuss or recap triggering material such as sexual assault in the review. Mention that the triggering material exists, but don't quote it or otherwise present it in a triggering manner. Do list things consistently in content warnings. List the content warnings at the bottom of the review. Readers who worry they may be triggered by the review can seek out the bold font content warning header to find the relevant information, but readers who do not want any content warnings will not be "spoiled" for content. Be consistent. Reviews are formatted in the same way and reviewers are given clear guidelines. This ensures that readers know what to expect. This is the whole point of content warnings, after all. Ready to Start Using Content Warnings? If you run a blog, publish books, talk about books on social media, or whatever else and wish to use content warnings, the best place to start is by reading some blogs and blurbs that use them. See what they mention, how they do it, and what works and doesn't. Several of us use a crowd-sourced list of content warnings, and add to it when needed. You can see the list here. This is a starting point only. If you don't want to use content warnings for your books or reviews, don't. But that doesn't entitle you to push back against reviews that give content warnings for your book or readers who wish your glowing recommendation came with a caveat. If you don't need content warnings, if you don't want them for your own reading - content warnings are not for you. Telling people that you don't want content warnings is like saying you don't like chocolate sauce on your ice cream. Good for you, let me get some hot fudge.